In the second part of this three-part series, we take a look at a few more Spring trips we’ve planned. Meditate with the monks of Burma, experience India’s holy land of Varanasi, and cruise the paradise that is Mauritius. We’ll give you the scoop into why these trips were designed the way they were. After months of planning, we’re thrilled to debut our newest trip this semester: Burma. The influence of Buddhism permeating this country, we thought that students might find an overnight stay at a remote monastery something a little different than their typical travel plans! With special permission, students will be given the chance to eat, sleep, and breathe amongst the monks of a local monastery. Early wakeups, meditation, and teachings of Buddhism: an immersion into the life of a monk. We’ve also coupled the experience with another influential part of the country’s culture—elephants! A ride through the jungle of Burma onboard an elephant? Not exactly an everyday experience! This is definitely one trip we’re proud to offer this Spring for those willing to step a little bit outside their comfort zones. Our itinerary for India is a staple of what we strive to plan in every country—sending our group as “global citizens” through an incredible few days of travel. 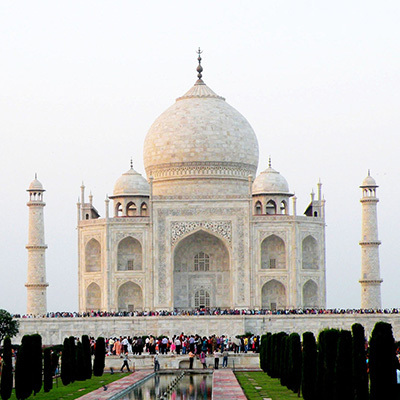 The Taj Mahal is a must-see and we wouldn’t consider planning the trip without it. However, our favorite part is actually the time spent traveling to and experiencing Varanasi. After time in Agra, rather than flying or leaving the next morning, the group will board an overnight train with virtually no foreigners on board to make their way toward Varanasi. Saving some daylight hours and bringing you an incredible experience? We’re all over it. Tough to put into words, but the ceremonies both at sunrise and in the evening are what students consistently tell us were among the most powerful and life-changing things they saw during their entire time abroad. As always, we aim to include authentic Indian food (bring the Pepto!) and experiences unique and important to the culture. In this case, we’ll be learning and playing a game of cricket, the national sport, with a group of university students, as well as visiting a local orphanage. Students that want to see and experience India as travelers—not tourists—shouldn’t let to this opportunity pass by too easily! Alright, we’ve got a confession to make. If there are any trips on here that don’t meet the Global Citizens mold of cultural exchanges and worldly experiences, it’d probably be this one. We wouldn’t plan on any culture-shock after this trip, unless a sunburn and a slight hangover would count for you. However, a one-day stop in beautiful Mauritius brings a few things to mind: the beach, sun, snorkeling, friends, and of course some delicious drinks. We’ve organized several catamarans of 30+ students to head out from port to the pristine Gabriel Island for all of the above. We’ll take our time cruising around the waters surrounding Mauritius while students lay out on open nets. Free time on the beach, a full barbeque for the group, and more than enough drinks will fill the afternoon before pumping the tunes and taking our time getting back to the port. It’s pretty tough to have a bad day in paradise! Don’t see what you’re looking for in these itineraries? Dates don’t work for you? Want to plan something for just yourself and a few friends? Shoot us an email and we’ll work to customize something that fits exactly what you had in mind.